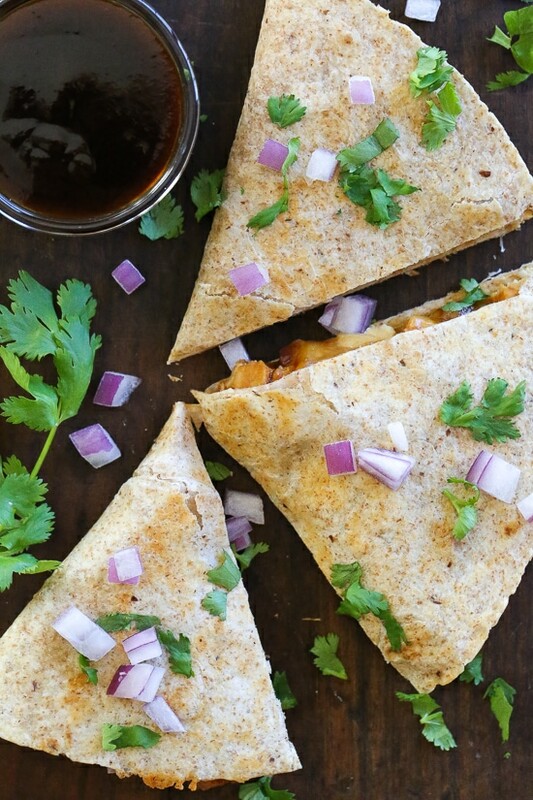 I love quesadillas, they make a quick lunch or light dinner and the kids love them! 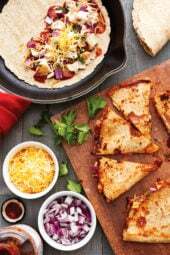 Some favorites are Chicken Quesadillas, Picadillo Quesadillas and even these Cuban Sandwich Quesadillas, so it’s great to add new ideas to the list. 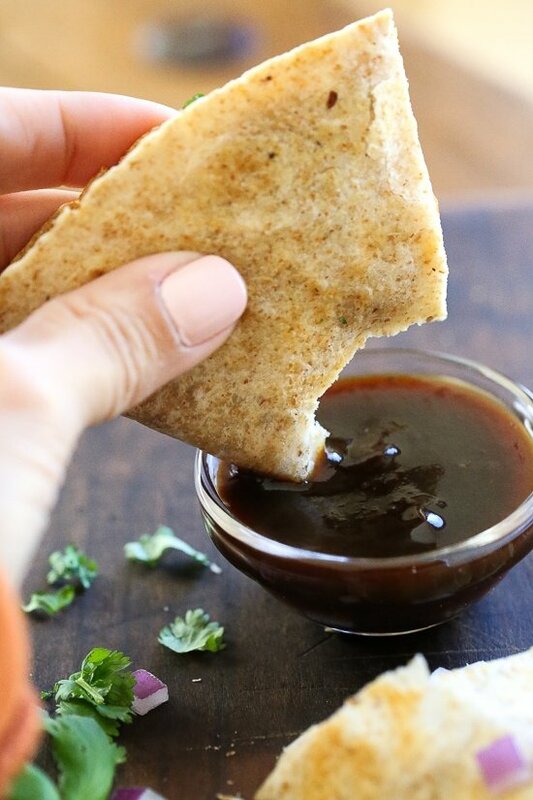 I’m excited to share this recipe from my friend Lisa’s (aka Hungry girl) new cookbook Hungry Girl Simply Six where she uses 6 main ingredients for each recipe plus spices. Her book is filled with easy low-calorie dishes that are not just easy to whip up, but also look delish! Use leftover rotisserie shredded chicken breast to save time. 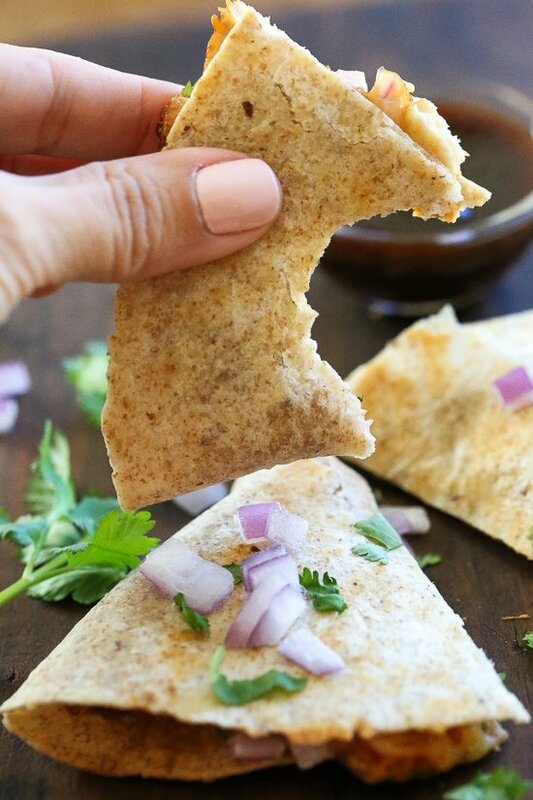 To make them gluten-free, use Siete GF tortillas, you may need to use two as they are smaller. Play around with different cheese options, I think pepper jack would taste great. Add some avocado for a hint of creaminess and boost of healthy fats. Bring a skillet sprayed with nonstick spray to medium-high heat. Sprinkle chicken with seasonings, and cook for about 4 minutes per side, until cooked through. Once cool enough to handle, roughly chop. In a small bowl, coat chicken with BBQ sauce. Lay tortilla flat, and spread BBQ chicken onto one half. Top chicken with remaining ingredients. Clean skillet, if needed. Respray and return to medium-high heat. Cook the half-loaded tortilla for 2 minutes. Fold the bare tortilla half over the filling with a spatula, and press lightly to seal. Carefully flip and cook until crispy, about 3 minutes.